I think Sauti sol were the ones supposed to sing the Huu Mwaka tune by Jaguar because this year has been tremendous and awesome for the award winning east African music kings. Kenya’s president uhuru Kenyatta is their biggest fan and this year, Uhunye has been seen dancing to Sauti sol’s mega hit Sura Yako monster hit song. POTUS Barrack Obama, during his maiden visit to his motherland, also danced with Sauti Sol and it the ‘news’ went viral. This same year, the Nerea hit makers are set to do a remix of their Isabella single with top American RnB crooner John Legend. 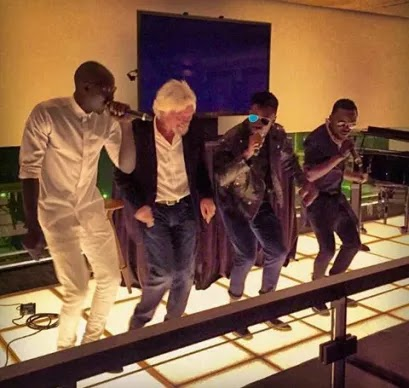 As if that is not enough, business magnet Richard Branson of the Virgin brand recently joined Sauti Sol and danced with them! The music maestros were performing at Hudson Hotel which was hosted by the business mogul. The super gifted boy band is currently in New York to perform at the Global Citizen Festival alongside RnB Beyonce, Ed Sheeran, ColdPlay, Peral Jam.